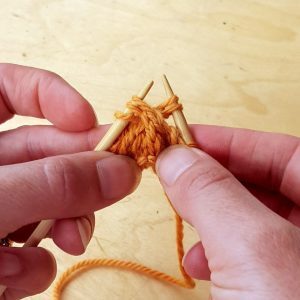 Carol Feller is an expert knitter and author of the book ‘Contemporary Irish Knits’ here her top tip on cabling without a Cable needle. 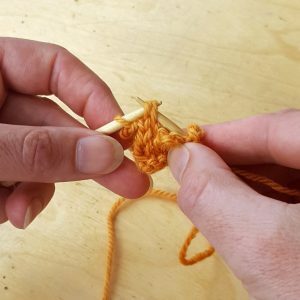 To create a cable without a cable needle you just manually move the stitches around until they’re in the position you want. Here you can see it worked for a 2 by 2 left cross cable. 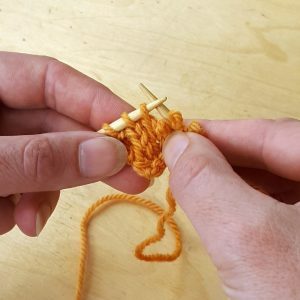 With a Cable Needle: Slip 2 stitches onto the cable needle and hold at the front of the work. Knit 2 stitches then knit the 2 stitches held on the cable needle. 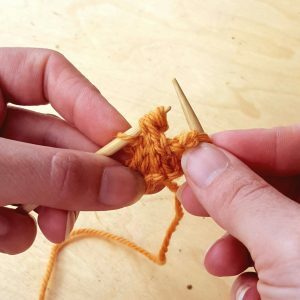 With your right thumb slide the first 2 stitches off the left needle at the front of the work. Slip next 2 stitches to the right needle. Return the 2 stitches held with your thumb back the left needle. Finally slip the 2 stitches back from the right needle to the left needle. Row 1 (RS): P1, k4, p1. Row 2 (WS): K1, p4, k1. Row 3 (RS): P1, 2/2 LC, p1. Row 4 (RS): K1, p4, k1.